Cristiano Ronaldo Jr has posted an incredible message to his father’s biggest rival, Lionel Messi. The Real Madrid star’s son met his hero at the Fifa best awards in October, when his dad swept home the main prize. Real Madrid star Cristiano Ronaldo’s son on Tuesday declared Barcelona forward Lionel Messi his “idol” in an Instagram post — or so it seemed. Ronaldo Jr. appeared set to follow in his father’s Instagram footsteps, with the Portuguese forward often posting clips of the seven-year-old’s goal-scoring exploits on social media, but the post was likely an internet prank by a verified user who goes by the handle “@mrahunter”. The youngster was believed to have set up an Instagram account over the the past 24 hours, with a first collection of posts seeing him reveal his admiration for Argentine icon Messi. 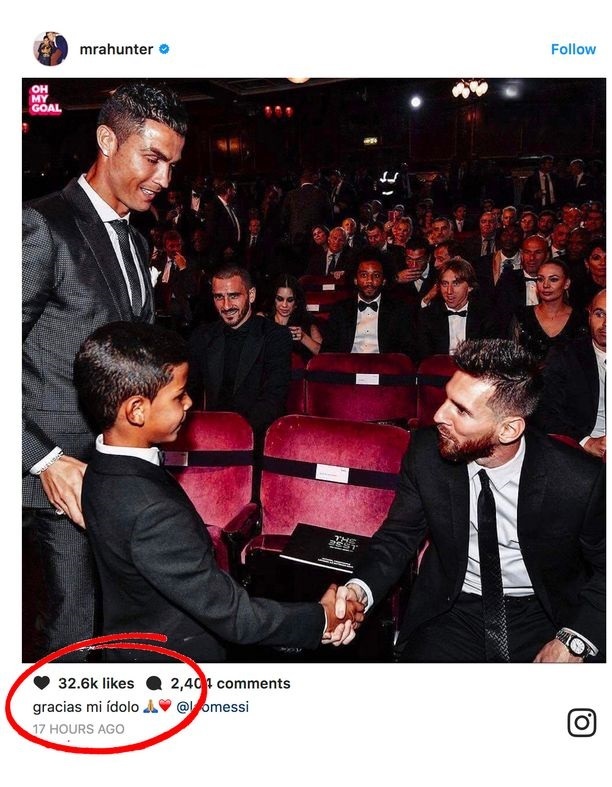 The post in question saw Ronaldo Jr. meeting the Barcelona talisman at the recent FIFA Best Awards and includes the message: “Thank you my idol, Leo Messi”. But later in the day, the message had been deleted along with the Instagram account. We may have to wait a few years before Ronaldo Jr. is old enough to have an actual social media account that CR7 fans can follow.